Jack in the Box wants to be different-er this year. 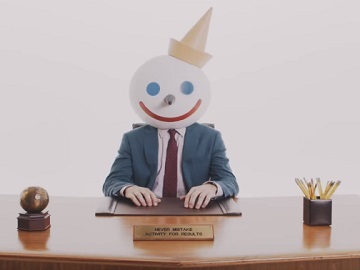 The company’s mascot, Jack Box, stars in a new commercial for the fast-food chain, nodding at big changes planned for 2019. “Everyone wants to be different. And I’ve been different. But now… now I want to be different-er. It’s totally different rules for 2019. By the end of the year, if it wasn’t for my giant head, you wouldn’t recognize me,” he says. The fast-food chain now offers, for a limited time only, though, Triple Cheese & Bacon Curly Fries and Chili Cheese Curly Fries for $3 each, the new B.L.T. Cheeseburger, made with hickory smoked bacon, two slices of American cheese, lettuce, tomatoes, and real mayonnaise – all on a buttery bakery bun, in a $4.99 combo, that also includes fries and a drink, and new Pannidos, including the new Deli Trio, made with smoked turkey, ham, and salami topped with a creamy Italian sauce, all on toasted ciabatta bread.